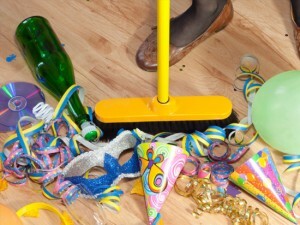 Are you too tired to clean up after the party that you have hosted? If you are, know that you can go and rest while we handle the job for you. We are certified and experienced cleaners and we provide the best after party cleaning services in Liverpool. We have been in the cleaning industry for a very long time and we have a rich history of successful jobs behind our backs. We have managed to maintain a 100% completion ratio throughout all these years because we have the necessary know-how, equipment and manpower to properly organise and execute sanitation projects of any scale and complexity. Another factor behind our astonishing completion rate is our team of competent and highly skilled sanitation technicians. Our workers are extremely dedicated professionals who will always give a 110% effort in order to provide to our clients services that match in full their demands and expectations. Even more, our employees are always ready to walk the extra mile and work round the clock if the job demands it. This is why we are the only cleaning contractors in Liverpool that work 7 days a week, 365 days a year we also do commercial cleaning services for the Liverpool area. This automatically means that you can hire us for any type of Liverpool after party cleaning project including New Year’s gathering. All the jobs for which we are contacted are carried out with the aid of our immense arsenal of cleaning instruments and eco-friendly detergents. We have invested heavily into the best sanitation equipment and cleaning solutions because we want to be able to clean anything and to remove any stain or spillage. This is why we have the confidence to promise you and all our clients that their sanitation projects will be conducted in a green and meticulous manner. We want our customers to feel comfortable with the fact that they have entrusted us with their after party cleaning duties. We believe that honesty and is only way to conduct a successful business. We don’t like to keep our clients in the dark. We don’t approach of firms that shock their customers with hidden fees. We have also insured our services. We have done so, not because we doubt their quality or don’t trust to the fullest our employees but because we want our clients to have the peace of mind that they will get reimbursed in the case of an accident. However note that to date we have never activated our insurance policy as we work with the utmost diligence. We invite you to explore our company website in full in order to learn detailed information about us, our services and methods of work. Also feel free to contact us during work hours in order to request a free quote or to ask us any questions that are on your mind. Know that we work with a flexible agenda, so booking us is very easy.